On a lovely summer's evening a very dirty deed was done, and probably only the first of many. At a full council meeting in Waltham Forest town hall, all 31 Labour councillors present slavishly raised their hands to vote through the first round of cuts. In Coventry, it appears that there will be a budget in the next few weeks where there will be a vote over cuts reaching a staggering £140 million. "Everybody uses public services and the fight to retain these services is a fight for all trade unionists and for the entire community." Over 100 community campaigners and activists from across the trade union movement attended the Bristol anti-cuts alliance launch meeting. Thirty local residents and trade unionists attended the Socialist Party's public meeting in Penarth, south Wales which was called about 15 jobs threatened from three fire stations as part of the misnamed 'risk reduction plan'. BLUNDERING EDUCATION minister, Michael Gove, is finding that the realities of life do not match his free market fantasies, writes Robin Pye. On 27 July, for the second time in less than a week, workers at Meggitt Aircraft Braking Systems based in Coventry went out on a 24-hour strike as well as imposing a continuous ban on overtime, writes Lenny Shail. We won't be a lost generation, fight for jobs and education! The statistics range wildly but one thing is obvious - young people's plans for the future are being dashed, writes Ben Robinson. AN OIL trading company has been fined £840,000 after being convicted for concealing the dangerous nature of toxic waste which was subsequently dumped in the Ivory Coast in 2006, causing thousands of people to fall ill, writes John Sharpe. The Tories’ new youth service plan is the latest attempt to use young people as free labour. Billed as “non-military national service””, it will offer 16 year olds an eight week programme of volunteering and community work immediately after finishing school. THE DAILY Mail headline read: "Hunger Striker's £7 million Big Mac". This outrageous attack, printed on 9 October 2009, accused Subramanyam Parameswaran of eating a Big Mac while 'pretending' to be on hunger strike in Parliament Square, London. Book now for the summer camp! The Socialist Party Summer Camp 2010, taking place from Friday 27 August to Monday 30 August, is the ideal opportunity for activists to come together to share ideas and experiences while enjoying a weekend of sports, singing and maybe even some sun. 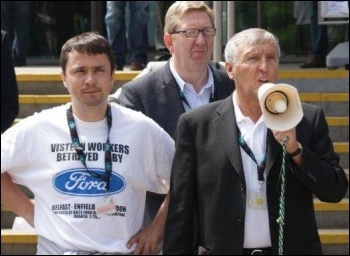 The Trades Union Congress (TUC), meeting this year in Manchester, needs to hear clearly from ordinary trade unionists and activists that the time has come to get off its knees and organise a fightback against the government's programme of cuts, writes Bill Mullins. Build national and local action: "Some people will be hit much harder by the VAT rise," cried the impassioned Tory councillor in Waltham Forest town hall, writes "Think of those who have to buy Bentleys," she continued!. Coventry City Council approved an emergency cuts package of £4.5 million on 10 August, with only a single vote against, writes Speaking after the meeting Cllr Nellist said:. 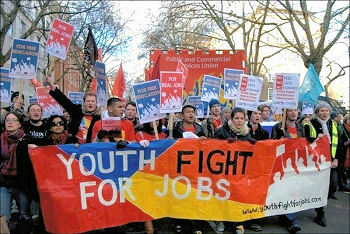 Youth Fight for Jobs - Press Release: The International Labour Organisation (ILO) has warned that there is a "risk of a crisis legacy of a lost generation", writes Paul Callanan, 23, unemployed and a member of the national steering committee of Youth Fight for Jobs said:. THE CON-DEM government is determined to use the excuse of a financial crisis to justify its aim to finish what Thatcher started - and Blair and Brown, in effect, continued - the comprehensive dismantling of the welfare state, writes Louise Cuffaro. PRIME MINISTER David Cameron, using the cover of tackling fraud, is bringing in credit referencing company Experian to challenge the claims of benefit claimants, writes Chris Newby. At a meeting in Belfast on 16 August, socialist and trade union activists agreed to form the Stop the Cuts Alliance in order to build opposition to the cuts from Westminster and Stormont, writes Gary Mulcahy, Socialist Party (Northern Ireland). On 3 August an overwhelming majority of participants in a public meeting of over 300 people condemned the installation of a network of police spy cameras around two predominantly Muslim suburbs of Birmingham, writes Tom Bower, Birmingham Socialist Party. "RMT members have sent a clear message in this ballot that they will not sit by while the tracks are turned into a death trap and our tube stations and platforms are left unstaffed." Transport union RMT general secretary Bob Crow declared after 43% of RMT members had voted by a 76% margin to take, writes Reg Johnstone. London buses: The London Bus Campaign will stage a rally outside City Hall on Wednesday 15 September to oppose cuts in services, fare increases and reductions in contract prices, writes Andy Beadle. 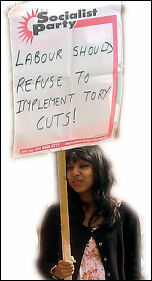 With thousands of young people being denied a university place, facing a substandard education, forced into low paid work or left on the scrapheap of unemployment, a nationally organised fightback is essential, writes Claire Laker-Mansfield, Socialist Students national organiser. As it becomes clear which groups will be hit hardest by the Con-Dems' cuts, it has been announced that careers services for young people in England face huge cuts in funding, writes Paul Callanan. The release of the report 'Why interns need a fair wage' by the Institute of Public Policy Research (IPPR) think tank has received much media attention, writes Matt Dobson. 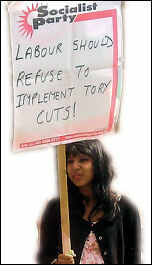 Action now to defeat cuts! Billionaire tax exile to slash services: A cabinet of millionaires appoints a billionaire to advise them on making cuts to our jobs and services, or as they refer to them - 'efficiencies'. 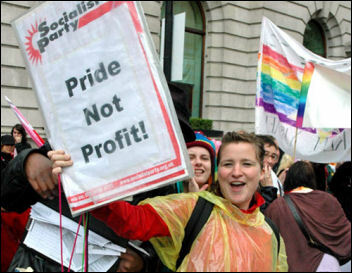 No surprise there!, writes Alistair Tice, Yorkshire Socialist Party. Youth must fight for a future! Community mental health care bosses in Southwark, south London, aim to save £3.7 million in two years, a mental health worker writes. 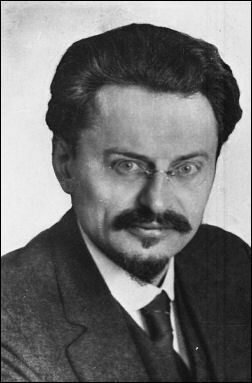 Socialist Party summer camp - book now! 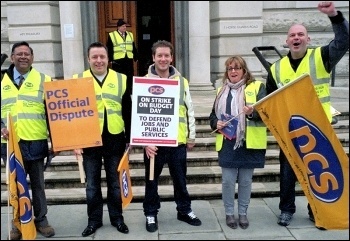 Communication Workers Union (CWU) members have accepted BT's pay offer of a 3% pay increase for each of the next three years, with this year's being paid from January instead of April, writes Clive Walder, CWU Birmingham, Black Country and Worcester branch, personal capacity. Youth Fight for Jobs is calling a demonstration on Saturday 21 August against the government's brutal attacks on access to education. It will be at 4pm, outside the department for Business, Innovation and Skills, 1 Victoria Street, London SW1H OET. Chief Fire Officer plans to sack every London Firefighter! 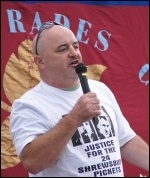 On 24 August, reps from transport unions TSSA and RMT met to discuss the first ever joint strike between the two unions on London Underground, writes Reg Johnstone. 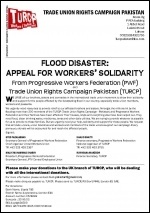 Kirklees Unison has launched a formal industrial action ballot, to begin strike action in September to challenge the council's swingeing cuts, Huddersfield Socialist Party members write.